You are looking at the hill where the Wright Brothers launched their gliders as they tested components and prepared for the first flight. It was a sand dune when they were there. They then launched the plane from the flat plain below. The first flight went 120 ft and lasted 12 sec. 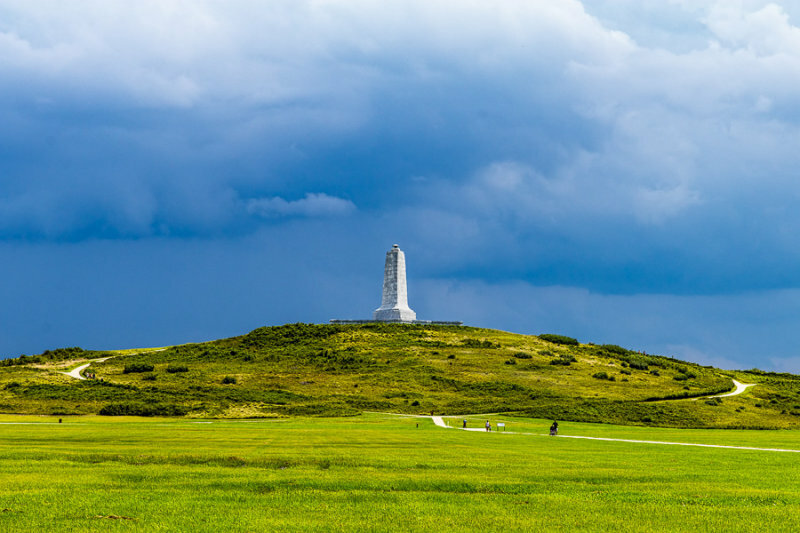 The monument on the top of the hill, Kill Devil Hill, is a centerpoint for the National Monument dedicated to Kitty Hawk and the Wright brothers. Dave - since I shoot in RAW, SOC is not really viable to show what the scene looked like. Here, there wasn't a lot of post work, though. Shadows bumped a little, as was clarity and vibrance. I did add a bit of dehaze to the clouds. The sun was fairly high in the sky, and not shielded by the heavy rain clouds, so there was a lot of contrast. And they have had lots of rain there - so the grasses were quite green. Love the colors. SOC? The clouds really do add. There was a storm rolling through just south of us. The rain line was about 2-3 miles away. Yes, it is pretty decent in size. I was about 400-500 yards away from the hill when I shot this.